The title choice is inspired by the wild and wacky weather we’ve had this week. We have gone from snow not too long ago and icy conditions to Spring conditions with temps approaching 70 degrees. It really is crazy for late February. Not that I mind. I didn’t even have to wear a jacket to work. So, is the end of the world near? 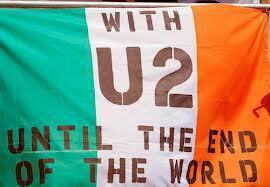 If you’ve heard U2’s underrated hit “Until The End of The World,” from the overlooked Achtung Baby album in the early 90’s, then maybe you can feel it too. But despite all the warning signs of manic and panic, the world isn’t ending. That’s a good thing. We get to choose what we want to do each day. I choose to enjoy every day to the fullest. Not the dullest like my job which can put you in a sleep induced coma. Customer service is so thankless. But I’m not here to discuss that. I’m here to remind everyone of everything good. You won’t get anything negative from me in this space. I choose to stay positive and think about the people in my life. My family is all here. My friends are too. The awesome coworkers I share laughs with over these six years. Of course, my writing which always has some creativity and paints a different picture which is unique and takes me away from everything. That’s art. That includes music. Something I will always share with people I meet. It also includes my random rhymes. I got my new car finally washed Thursday. It only took 30 minutes after the first place was too backed up. Everyone wants to do it when the sun is shining and the weather is nice. Almost too nice for words. But I’ll take it. We all will. 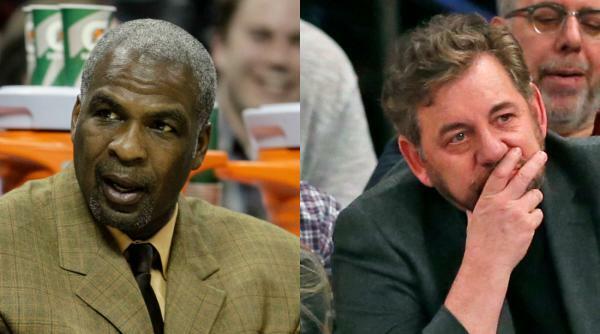 Despite a noble attempt by NBA commissioner Adam Silver along with Michael Jordan at a meeting between Charles Oakley and Knicks owner James Dolan, Oakley remains furious at Dolan. The latest has Oakley basically accusing the MSG owner of being similar to former Clippers owner Donald Sterling in an interview with Sports Illustrated’s Maggie Gray. While Oakley is justified in wanting a public apology from Dolan for falsely accusing him of being an alcoholic before the he agreed to lift the ban, accusing the man of being a racist is out of bounds. The notion that he is seems far fetched. What proof is there? It’s painfully obvious that an emotional Oakley has let a complex situation get the best of him. Even with Dolan apologizing as did the former Knick and uplifting the proposed ban from The Garden, it’s not enough to repair the relationship. An apology would help. But it’s unfair to compare Dolan to Sterling. An awful man who was outed in Los Angeles for racist comments made to his former girlfriend were caught on tape. Sterling couldn’t believe Oakley’s accusation. He praised Dolan calling him a terrific owner. I’m not sure Knicks fans would agree with that statement. However, Sterling should know. He holds no ill will towards Silver and praised him for how he handled the Clippers situation in 2014. As for Oakley, he has gone too far. He should publicly apologize for what he said. After that, who knows. I am not sure we’ll ever see the day where Oakley and Dolan are seen in the same building together. It’s obvious that he’s hurt himself with such sad commentary. Very poor choice of words. Now, he makes himself out to be as bad as Dolan, who was in the wrong. What it proves is that neither man is perfect. They are flawed. Each have faults. As human beings, we all make mistakes. It takes a bigger person to admit to them and say, “I’m sorry.” Here’s hoping that things cool down for a while. Now might be a time for Oakley to just take a breather. He made Dolan a sympathetic figure. Something I never thought was possible. As expected, the New York Giants cut ties with Victor Cruz. The popular wide receiver who was a huge part of the special 2011 season resulting in the franchise’s fourth Super Bowl championship, was released along with running back Rashad Jennings to cut about $10 million in salary freeing up cap space. Cruz will be best remembered for his amazing run. In 2011, he came out of nowhere to become the Giants’ best receiver finishing with 82 receptions, 1536 yards and nine touchdowns. Astonishingly, the undrafted receiver out of the University of Massachusetts was an afterthought for that special season. He was fourth on the depth chart before an injury to Domenik Hixon gave Cruz his big chance. Combining with Hakeem Nicks to form a deadly tandem who Eli Manning could trust, Cruz became the dangerous threat in the middle of the field who could break away for scores like a track star. Along with sidekick Mario Manningham, whose clutch catch in a Super Bowl rematch with the Patriots set up Ahmad Bradshaw’s winning score, Big Blue had a balanced attack featuring the aforementioned Bradshaw and popular bruiser Brandon Jacobs. The kicker was the clutch Lawrence Tynes, whose dramatic game-winning field goal at Lambeau Field on the frozen tundra sent the Giants to Super Bowl XLII in sudden death where they stunned the undefeated Pats 17-14 as predicted by Super Bowl hero Plaxico Burress, who caught the winning score from Manning. A game best remembered for Eli escaping a sure sack and then hurling a laser down field which was somehow hauled in by David Tyree with him miraculously clinging to the football against his helmet. Justin Tuck led a defense that featured Osi Umenyiora, Jason Pierre-Paul, Mathias Kiwanuka, Antrel Rolle and Corey Webster. Michael Strahan had already retired for a successful TV career that’s been outstanding where he co-hosts the NFL On Fox and is moving on to bigger and better things at ABC. Thinking back to that 2011 season, it hung in the balance in a defining game against the Jets. It was Tom Coughlin’s humble Giants who prevailed over Rex Ryan’s supremely confident Jets due to an amazing 99-yard touchdown catch and sprint by Cruz. A play that is often replayed for keying that run. They were in trouble having lost five of six including a gut wrenching defeat to the Redskins after a big win over the Cowboys. It was do or die against the Jets, who needed the game just as badly. Cruz’ big touchdown was the one that carried Big Blue to the win as they pulled away. The Giants would defeat the Cowboys in the final week 31-14 to win the NFC East. After hammering the Falcons 24-2 at home, they went to Green Bay again just like in 2008. This time, it wasn’t Brett Favre they beat. But Aaron Rodgers. The defense dominated and the offense kicked it into high gear led by Manning’s three touchdowns including two to Nicks. Jacobs and Manningham also scored as there would be no dramatics in a 37-20 win. They advanced to the NFC Title game where they faced old rival San Francisco. It brought back memories as the two classic rivals from the 80’s, 90’s and even early 00’s clashed. The 49ers had already beat them in the regular season. But the Giants found a way to slow down Alex Smith. A Manningham touchdown combined with a David Akers field goal forced sudden death. A lost fumble by Kyle Williams on a punt return set up Tynes’ winning field goal from 31 yards out sending the underdog Giants to Super Bowl XLVI where they would defeat the Patriots again. This time by a score of 21-17. They don’t get there without the valuable Cruz, whose 10 receptions for 142 yards took apart the 49ers’ secondary. In the four-point come from behind victory over New England, he caught a touchdown pass from Manning. On an impressive drive with the team trailing 17-15, Manning led them down field. He handed off to Bradshaw, who didn’t want to score. But his momentum carried him into the end zone putting the Giants ahead 21-17. The two-point try was unsuccessful. The defense got the job done stifling Tom Brady and the vaunted Pats offense. Honestly, without that D which also keyed the monumental 17-14 upset of a perfect New England team entering Super Bowl 42, there’s no championships under Coughlin. And both were amazing runs which came unexpected. On the biggest stage, Manning performed well winning two Super Bowl MVP’s. However, Tuck could’ve won one. Somewhat interesting about the Giants franchise history, in all four Super Bowl wins, they have faced the AFC opponent once in the regular season. They went 2-2 in those games only to win all four for the Lombardi Trophy. The only time they didn’t was Super Bowl XXXV when the dominant Ravens defense hammered them 34-7 in 2001. He deserved it. Now 30, he’s been a classic overachiever. If not for injuries, Cruz would still be a Giant. Bur that has a way of changing things. We’ve seen it so many times in the NFL. Whether it be Nicks, Steve Smith, Bradshaw or Cruz, they can shorten careers. It’s a shame because Cruz is the local kid from Patterson, New Jersey who made good. His salsa dance will always be classic after scoring. He’s beloved by fans. Even if his role diminished in a mostly healthy 2016 that saw the Giants get back to the playoffs with only 39 catches for 586 yards with a touchdown, he’ll always be cherished by New Jersey and New York fans who live and die with Big Blue. We know what he did and we appreciate it. Cruz says he thinks he still has plenty left. So, it looks like he’ll move elsewhere. The Broncos are showing interest. The thing is how much does he have left. He’s had so many setbacks. It makes one ponder if he can ever be a consistent player again. I am rooting for him. Even if he admitted fault with the whole boat party in Miami on New Year’s Eve prior to getting eliminated by the Packers, it doesn’t change my perspective. Charles Oakley is apprehended by MSG security after an incident that they instigated. Not what Knicks owner James Dolan wants fans to believe. AP Photo via Getty Images courtesy SportsCenter. There once was a team I rooted for growing up without any care in the world. They were my hometown New York Knicks who played in the center of it all near Broadway. Those days are long gone. Dead and buried thanks to a heartless snake named James Dolan. The glory days of meeting Walt “Clyde” Frazier at his basketball camp and still having an autographed ball and picture with my family feel like an eternity. That I went to his camp was so cool enough. And to think he was at the Chase branch here in Arden Heights Shopping Center when it first opened and signed again and was so personable I will never ever forget. These Knicks made you proud and the Garden loud. A raucous atmosphere back when Marv Albert and Clyde called the games on MSG. What a duo. You had Mike Breen and the legendary John Andariese on radio. They were run the way a franchise is supposed to be. With class. It’s still hard to fathom how close those teams really were. From the nightmarish conclusion to Game 5 of the ’93 Eastern Conference Final to the Starks’ nightmare of a Game 6 in the ’94 NBA Finals at Houston, it really hurts. Even all this time later, I can’t wrap my head around it. How they never won an NBA title with Ewing. They’re still stuck on two with no end in sight. Are we ever gonna stop remembering ’69-70 and ’72-73? I’m grateful for all the videos of Willis Reed coming out for Game 7 and hitting those first two shots as Frazier dominated to lead the Knicks to an upset over the powerful Lakers of Wilt, West and Baylor. I can only imagine what it was like to watch Clyde and Earl “The Pearl” Monroe in the same backcourt win the franchise’s second championship over the Lakers in easier fashion. Teams that included Dave Debusschere, Bill Bradley, Jerry Lucas, Phil Jackson and coached by Red Holzman. I wish they could’ve won in the 90’s. Don’t forget that miracle ’99 team that barely made the playoffs and then edged the despised Heat in five on Allan Houston’s shot that hit the rim and took a favorable bounce in with him pumping his fist. The same team that featured Latrell Sprewell, Larry Johnson, Marcus Camby and Chris Childs with Kurt Thomas and Charlie Ward. When Ewing went down, Chris Dudley played center along with Thomas. It’s still one of the most amazing runs with the Johnson four-point play at MSG against Reggie and those hated Pacers one call we got in our favor. Maybe it made up for the Reggie Miller game in ’95 which turned into an ESPN 30 For 30 documentary called, Winning Time. A series that still went seven even after Miller’s miracle at MSG when he scored eight points in nine seconds and gave the choke sign to super fan Spike Lee. At least these days, I can laugh at it. But when I still see Ewing miss that finger roll at the stunning conclusion of Game 7, it kills me inside. There was the whole circus when players came off the bench in Game 5 of a heated Conference Semifinal in ’97 from both the Knicks and Heat that turned that series around in which David Stern suspended Ewing, Houston and Ward for Game 6. Johnson and Starks sat out Game 7 as Tim Hardaway led the Heat to a stirring comeback along with Ewing’s close friend and rival Alonzo Mourning. It ruined what could’ve been the one chance to finally beat the Bulls. I really felt that team had a legit shot to beat them after going into Chicago and winning during the regular season. I believed. It’s funny when I look back on it now. How did we go from a decade of great Knicks basketball to this? It started a long time ago when they dumped Ewing and took on some awful contracts which killed their salary cap. It ended an era when they lost to Miller and those Pacers in six games in the 2000 Eastern Conference Final. Ewing’s final game as a Knick. Indiana went on to lose to the powerful Shaq and Kobe Lakers. I can cite all the names where they went wrong. Eddy Curry. Scott Layden. Antonio McDyess. Stephon Marbury. Even Starbury failed here. Isiah Thomas had a hand in that. He really screwed with Marbury’s mind building him up. Then Jason Kidd and the Nets undressed him and the Knicks in a big showdown letdown. Marbury and Jamal Crawford were a fun guard tandem. But those teams lacked the necessary toughness to compete. Even when they made the playoffs in 2004 with a beaten up Houston still around before Crawford, they were no match for the Nets getting swept. Penny Hardaway was a shell of himself. It’s too bad because he really could’ve been one of the best if not for all the injuries. A malaise took over The Garden. Dolan was running things into the ground. He had been for quite some time with the awful dismissal of Albert following an off the court controversy that humiliated him. He was the voice of the Knicks. They transitioned to Breen and Clyde and they still are calling the shenanigans at 33rd and 7th. Breen fortunately gets ABC or ESPN assignments. So, he doesn’t always have to do their games. Kenny Albert fills in now when he’s not doing Rangers games. I still despise how Mike D’Antoni ran Marbury out of town. But he thought Chris Duhon could be his starting point guard for a full 82 games playing a run ‘n gun style emphasizing the extra pass. Duhon was gassed by the second half and wasn’t used to all the minutes. That’s why they failed. Even when Dolan brought in Larry “Next Town” Brown for a year prior to the No ‘D’antoni Era, it was an unmitigated disaster. Brown and Marbury butted heads. He rubbed the players the wrong way. Even a nice rookie class featuring future All-Star David Lee, NBA dunk champion Nate Robinson and three-point fixture Channing Frye couldn’t save them. Thomas traded away Trevor Ariza and then drafted Renaldo Balkman and hired gun Mardy Collins. If you’re a Knicks fan who goes back a decade, you know what I’m referring to. Another genius punk move by Isiah. They all have come and gone. Steve Francis. Tracy McGrady. Zach Randolph. Tim Thomas. Larry Hughes. Al Harrington. Marbury. Crawford. A new batch of young talent in Danilo Gallinari and Wilson Chandler, who were both shipped to Denver along with Timofy Mozgov, Ray Felton and two first round picks that became current Nugget Jamal Murray and current 76er Dario Saric for Carmelo Anthony, Chauncey Billups and too much excess to name. Dolan was behind it basically overruling Donnie Walsh which eventually led to him leaving to return to Indiana. The spoiled brat just couldn’t wait. He had to get Melo even at the cost of severe over payment which further damaged the franchise. Nothing against Anthony. He’s been a good Knick who has scored so many points. Now 25th on the NBA all-time scoring list after passing Sir Charles, he has never had the supporting cast since that blockbuster trade. Dolan subtracted too much. The best cast was Anthony, Amare and J.R. Smith headlining Mike Woodson’s team that won 54 games and the Atlantic Division. But the Pacers eliminated them in the Conference Semis in six. The ’11-12 team went down in five to the then powerhouse Heat led by LeBron, Wade and Bosh. A series best remembered for Amare losing his cool injuring himself. By then D’Antoni was gone with Melo disliking him. There was the whole Linsanity phase when he was out hurt and Jeremy Lin shocked the world by playing remarkable ball at the point. Anthony won the power struggle with Woodson replacing D’Antoni. He took them to the playoffs twice. In fact, he went 70-34 in those two years. He should’ve gotten a medal. That team also featured Tyson Chandler and Kenyon Martin. Plus popular vet Rasheed Wallace before he got hurt. They had defined roles with Kidd doing a fine job before breaking down. Even Pablo Prigioni played a role as a key backup. Felton was back to run the offense and Iman Shumpert was the kind of defensive guard Knicks fans appreciated. It’s hard to believe they lost to Indiana. But the Pacers had Paul George, Lance Stephenson, George Hill, David West and Roy Hibbert, who outplayed Chandler. It would’ve been nice to see that roster challenge the Heat in the Conference Final. But it wasn’t to be. Since then, it’s been nightmare after nightmare. Phil Jackson was hired by Dolan to run the Knicks operations as Team President. He gave him full power. Similar to Glen Sather, when he ran the Rangers into the ground before rebuilding them into a contender. The biggest difference being for as great a coach as Jackson was, he had no previous management experience. Sather won five Stanley Cups with the Edmonton Oilers dynasty. Jackson is arrogant. He doesn’t communicate well. He avoids the media at all costs like Dolan, who at least showed up and gave an interview on the Knicks radio station ESPN the other day after the whole Oakley escapade. It really is as bad as it sounds. Charles Oakley remains one of the most popular Knicks due to his tough mentality and hard nosed approach. He stood for what those Knicks teams were before he got traded to the Raptors for Camby. He left bitter. But it worked out for the Knicks with the Camby man blossoming during the ’99 run. Unfortunately, they didn’t have Ewing for the Spurs’ tandem of David Robinson and Tim Duncan. I can still see Sprewell having that shot blocked as San Antonio celebrated on the Garden floor. The thing about Jackson is he is a former Knick who was part of those two championships. As much as we loathed him when he ran the Jordan and Pippen Bulls winning six NBA titles and then going to Hollywood and winning five more totaling 11, he was supposed to know better. But here he is in La La Land tweeting out silliness like the one aimed at LeBron and his posse. A poor choice of words which James overreacted to. These days, the self-proclaimed King James will yak about anything even if it’s controversial and forced. I don’t care for it. His basketball should be enough which is legendary. Especially how he carried the Cavaliers back to give Cleveland their NBA title from a 3-1 series deficit against the mighty Warriors. Ever since the current Knicks started out a promising 14-10 with a new cast featuring Anthony, rising star Kristaps Porzingis, Derrick Rose and Brandon Jennings, the wheels have fallen off literally. It coincided with Jackson’s press agent writing a controversial article about how Jackson had no more use for Anthony. Way to treat your star player. The same one you signed off on as one of your first moves as Team President. That btw included a no-trade clause. Typical Phil. He really thought Anthony was Jordan or Kobe. Those are special players. Melo is a very good star player who is a scorer first. He doesn’t always make teammates better. He also has had games where he’s broken down in the final quarter by misfiring on shots in crunch time. He’s been beat up. He isn’t smooth. He works for his points. Whether it’s in the post or from the outside or at one of his spots, Melo always gives it everything. Defensively, he’ll never be confused with Jordan, Pippen or Kobe. But he has played the four and rebounded the ball. He also proved he could distribute it last year posting a career high 4.2 assists with over 21 points a game and nearly eight rebounds. Carmelo Anthony has been a hot topic for Knicks fans due to Phil Jackson’s mistreatment. Melo scored 21 of his 25 in the second half to give the Knicks their best win of the season amidst chaotic distractions due to idiot owner James Dolan. AP Photo via Getty Images courtesy NYKnicks. Anthony has been nothing short of professional. Even with trade rumors swirling with the deadline approaching following the All-Star break, he’s stayed focused. He wants to stay and be a team leader. Porzingis has spoken highly of him. You think his development hasn’t been helped by Anthony? It’s become hip to rip your best player. Take him away and they would really stink. Some fans want to tank for the lottery. I don’t think that was Jackson’s intention when he brought in Rose, Jennings and signed Joakim Noah and Courtney Lee. Don’t tell a few of my misguided friends. The goal is to make the playoffs. You think Phil wants to miss again? They’re 22-33 even with the best win of the season over those Spurs, who basically are Kawhi Leonard. That’s why they can’t be taken seriously in the West. Nobody told Jackson to give a clearly banged up Noah four years. Lee has been good in spurts. He’s finally starting to make shots again and play well after pouting when Jeff Hornacek had him coming off the bench. A mystifying move that never made sense. Maybe Hornacek’s latest move of having a three hour practice and video session in which he let players point out their mistakes when they gave up an ungodly 131 to the Nuggets will be a turning point. A game they lost 131-123 despite 21 fourth quarter points from Anthony. He fumed afterwards about how the first unit got their points but didn’t guard anyone. He wasn’t wrong. So, when the Knicks held the Spurs to 90 and prevailed in a close game, it was a different ending than we’re used to. This happened while Sprewell returned to MSG and was seated next to Dolan as if they were best pals. It had been 13 years since he’d been there. I love what Sprewell brought as do many Knicks fans. But if this wasn’t a publicity stunt by Dolan in response to the Oakley “ban” after his MSG security actually initiated the whole thing where Oakley lost his mind shoving a guard and getting taken out by about nine security and police who arrested him, then I must be blind. Dolan will do anything to put a positive spin on his ugliness. The video below shows what MSG doesn’t want fans to see. It shows Dolan’s security starting with Oakley first by pushing him to the ground before number 34 lost his cool. Judge for yourself. By now, we all know the story. Or the one Dolan wants us to. How Oakley acted horribly when he entered the arena after buying a ticket. And how he needs help as if he was an alcoholic. A ploy this lame owner has used before doing it to a poor fan who wrote him a letter a couple of years ago. The man has zero class. He’s a nobody. Oakley has many supporters. He’s spoken about the incident since. He’s admitted he was wrong. He let the tense situation get the best of him. That’s not how you treat a former player who gave your team and its fans plenty of great moments. Nobody hustled more than Oakley. He dove for every loose ball and would frequently wind up in the stands. Classic New Yorkers appreciate him. In what’s supposed to be the 70-Year Anniversary of the Knicks, here are Dolan and lackey Jackson making the situation uglier. They are insulting our intelligence. The owner is still far worse than Phil, who just can’t help himself. It makes you wonder if he’s on the Lakers’ payroll still. The lies and deceit are there for everyone to see. You can’t make it up. Dolan has stood by Jackson saying he intends to let him run the outfit through his five-year contract. It’s in Year 3. The playoffs were supposed to be guaranteed this year. But not when it comes to the Knicks. We have to learn the hard way. Can the team take something out of the San Antonio win and start a winning streak into the break? That’s up to the players. They’re the ones who have to look in the mirror every day and not let the Dolan idiocy and Jackson delirium distract them. I still support the players. I will never support that clown who owns the team.